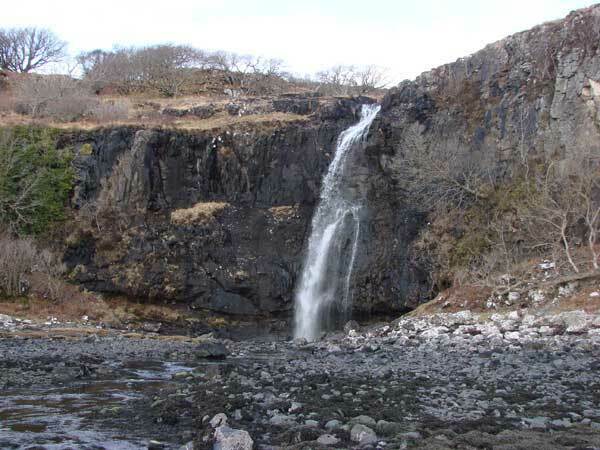 Eas Fors Waterfall is one of the most spectacular waterfalls on the island, situated just off the B8073, a couple of miles North of Ulva Ferry. There are captivating views across Loch Tuath to the island of Ulva. 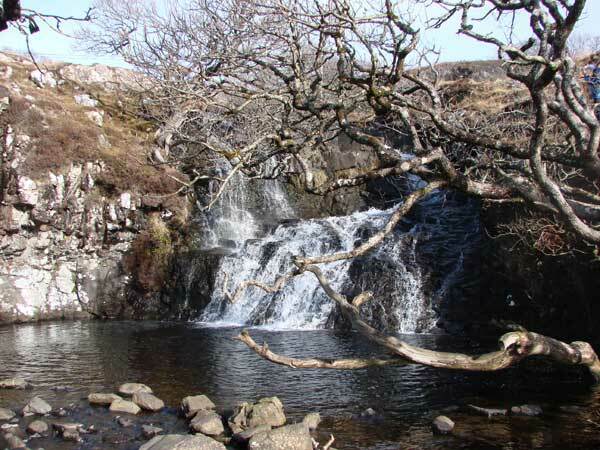 The ‘Eas Fors Waterfall’ place name is tautological as all three words are synonymous. This often occurs when a name from one language is imported into another and a standard descriptor is added on from the second language. Eas is Gaelic for waterfall, Fors is Norse for waterfall so it could be said that Eas Fors Waterfall is labouring the point slightly! There is a small parking area before the bridge and it’s worth walking up the track to the Upper Falls where there is a safe viewing point. Eas Fors consists of a series of three waterfalls, the Upper Falls being above the road, and the Middle Falls just below the road. There is a lovely pool below the Midde Falls and a great place to have a picnic BUT NOT WITH YOUNG CHILDREN as this is potentially a very dangerous location. The final fall plunges 100 feet over the edge of the cliff to the sea below. There are no barriers and the grassy ground can be very slippery at times. The only way to view the Lower Falls safely is to walk a half mile down the road towards Ulva Ferry and then take the track along the stony beach. The walk will take no more than half an hour and is the most dramatic and safest way to view the falls. DO NOT ATTEMPT TO LEAN OVER THE EDGE TO SEE THE DROP. If you’re not able to walk along the shore to view the waterfall, why not click on all the images on this page to enlarge. 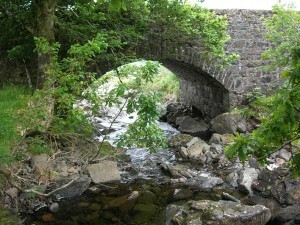 Use your imagination and picture yourself standing beneath this gushing torrent of water.